I count myself among those who were royally disappointed when one of Finland’s unsung power metal heroes Olympos Mons decided to close shop after a brief, two album run. They had taken on a rather interesting mixture of neo-classical, traditional and melodic power metal ideas and put forth a very different sound from the flash and grandeur typical to many of the Stratovarius oriented bands of the day, but also were completely untouched by the AOR infused trend that was brought in by Edguy and Masterplan. This isn’t to knock either of those two new traditions within the power metal paradigm, but it was refreshing to hear a band that could write a catchy song while still experimenting a bit with some of the extraneous elements that were either absent from the equation or exaggerated to the point of dominating the entire listen. In other words, where Olympos Mons made their mark was by being a bit more nuanced than the rest, and when it had been revealed that the vocalist and bassist of said band had a new project dubbed Astralion, I expected something along similar lines to their former project. It might come as a shock to many familiar with the mature, measured character of Conquistador, but what is found on Astralion’s self-titled debut is about as far removed from the character of said album while still remaining in the same basic style. This album dispenses with any sense of subtlety and goes for the most raucously fast, celebratory, ultra-consonant sound heard out of the Timo Tolkki mode of songwriting since the last Dreamtale album and essentially one-ups it with seemingly little effort. Part of this can be attributed to the thrash metal credentials of the guitarist and drummer that have been picked up from the Finnish act The Addication, resulting in something along similar lines to what Thunderstone accomplished when they first put their act together. Similarly, the keyboardist comes with a set of chops about roughly along the same skill set as Jens Johannson, though perhaps a bit stricter and more methodical in how he puts together a keyboard solo. What is perhaps a bit surprising is that for the radically different character that this album has compared to the Olympos Mons debut, it is structured in a very similar way. The album cycles through a series of highly impressive speed songs that are faster and catchier than the fastest numbers on Conquistador, but also a bit simpler in structure and easier to follow. Slower songs are still largely within the realm of being up tempo, and the guitar sound tends to stick to a nimble approach rather than a bottom heavy chug, and there is only one true ballad in “To Isolde”, which is actually a rather brilliant display of how Edguy used to write ballads back in the late 1990s, but with a vocal job more reminiscent of Kai Hansen. Topping things off at the end is a whopping 13 minutes plus epic sailor’s song after the mold of something that Wuthering Heights might attempt, but translated into a Stratovarius-like format. It takes its time at the beginning, but once it gets going, it ends up in the same sort of speedy territory that the triumphant speeding symphony of victories found on here such as “Mysterious And Victorious” and “When Death Comes Knocking”. About the only thing that can really be counted as a flaw on this album is the somewhat ridiculous looking album cover, which would probably have been more at home on a thrash metal album, but these guys don’t play music with their album art. It’s the sort of music that will pick you up out of that depressing place known as the real world and send you flying through the air on the wings of a great black dragon. It’s melodically tinged, fantasy steeped escapism like the sort that was more common place 14 years ago, and is only really rivaled today by the recent Twilight Force debut out of neighboring Sweden. Pretty much anyone who has heard of Dreamtale, Gamma Ray, Thunderstone, Conquest, Sunrise or Stratovarius will find the same story here, but told with a good deal more energy and vitality than many of their latest offerings. Suit up for flight, for “we all made metal”, and now it’s time to ride it to a whole new dimension. 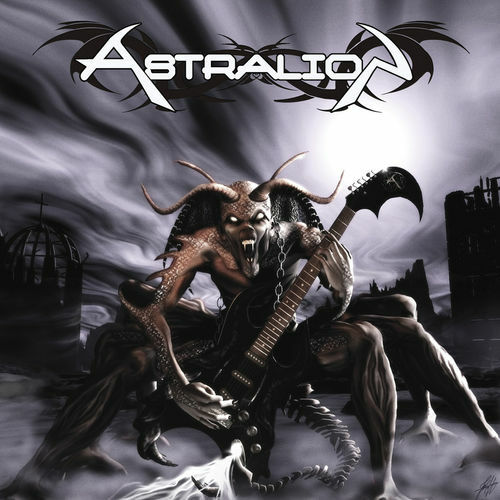 This entry was posted in Reviews and tagged Astralion, Burning Point, Conquest, Dreamtale, finland, gamma ray, Melodic Power Metal, Olympos Mons, Stratovarius, Sunrise, Thunderstone, ukraine.